Jesus cautioned against praying “vain repetitions” (Matthew 6:7). Do you find it difficult to avoid repeating the same words in your daily prayers? Early in His ministry, Jesus gave His disciples a model prayer so that they would know how to talk with the Father. It is part of the “Sermon on the Mount” (Matthew 6:5-15). Jesus did not want His disciples simply to recite what He told them. Obviously, the disciples would have done that, if that was all there was to praying! They perceived there was more to it by seeing Jesus’ example over the years, and they asked for additional guidance. Seeing Jesus’ example prompted one disciple to ask Jesus (on behalf of them all) to review His instructions. Luke records Christ’s answer in Luke 11:2-4. This has inappropriately come to be known as “The Lord’s Prayer,” instead of “the Lord’s model for praying.” Jesus said, “In this manner, therefore, pray” (Matthew 6:9, emphasis added throughout). In prefacing His instructions about prayer in the Sermon on the Mount, Jesus gave this challenging counsel: “And when you pray, do not use vain repetitions as the heathen do. For they think that they will be heard for their many words” (Matthew 6:7). What is challenging about that? Don’t just recite Jesus’ model prayer, the prayers written by other people or the prayers written by churches for their followers. Pray original prayers. But do you find yourself repeating essentially the same words every day? In spite of the fact that you don’t recite prepared prayers, do you find nearly the same words coming out of your mouth in your daily prayers? Many Christians do! You kneel by your bed or a chair to pray and you follow Christ’s model, but you slip into repeating the words you prayed yesterday, the day before and the day before that. Every day, begin your main prayer by praising God for an aspect of His character or for the splendor of part of His creation. Pray about the Kingdom of God. It is His purpose in creating humankind. It is your purpose for being alive. Pray for what He knows is best to happen throughout the world—“Your will be done.” Pray for your daily needs; confess your sins and ask forgiveness; forgive others while you are on your knees before God. Ask God to keep Satan from you that day. Break every prayer down into detail, symbolized by the fine incense God’s priests used to burn in the temple (Exodus 30:7-8, 36; Psalm 141:2). Pray about every aspect of preaching the gospel. Pray about the Church of God, including its ministers (1 Thessalonians 5:25; 2 Thessalonians 3:1) and members (James 5:16). God’s congregations need safe meeting halls, inspired messages and fellowship. God’s people need to plan for and observe the biblical festivals. Pray for governmental leaders (chief executives, lawmakers, judges, law enforcement personnel, administrators), as well as for leaders of business, finance, education and science—every type of leader whose work affects the lives of believers (1 Timothy 2:1-2). Pray about yourself! Because you probably find yourself praying on this topic every day, you might feel guilty about doing so. But we must pray about ourselves, asking for physical needs and spiritual needs. In fact, if we aren’t praying about spiritual issues, we will not win our battles against human nature! Many of the biblical Psalms, which are songs and/or prayers, speak of the personal spiritual struggles of the author. Here is a simple, but highly effective way to avoid that frustrating experience. Emphasize a different main subject on each day of the week. Sunday: Focus on the entire world outside of your home country. Apply all of the above mentioned instructions as you pray about all nations other than the one in which you live. In order to do this meaningfully, you will need to stay informed about God’s Church in other areas of the world, as well as about world news. Monday: Focus on your home country and apply the same approach. Again, you will need to remain informed about both the Church of God and what’s happening in your nation. Tuesday: Focus on your home area (state, province or region). By now, you have the idea. Follow Jesus’ instruction, but zero in on this narrow target. Wednesday: Focus on your family. Here is another area that you are likely to end up spending your prayer time on every day to the neglect of other matters. By dedicating a single day to family every week, you both help them and avoid vain repetition. 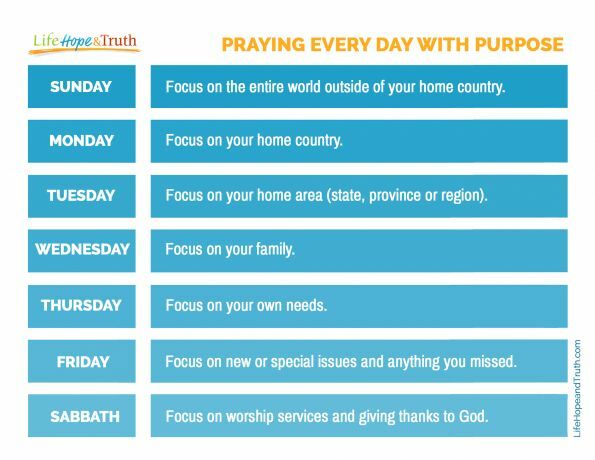 Thursday: Focus much of your prayer time on your issues and needs. This will help you avoid spending overly much time talking about yourself every day. Don’t feel guilty. You need to do this! Friday: Use this as a day to catch up on anything missed or anything that has come up during the week, requiring special mention. Often there are people or issues about which we need to petition God in detail. It is also a good day on which to pray about every aspect of Sabbath worship. Sabbath: Of course, you should ask God’s blessing on worship services. But set aside most of your prayer time this day for thanking Him. (Consider how it would improve family relationships for children to thank their parents in detail for all their benefits. It would probably shock the parents!) Imagine how it will improve your relationship with our Heavenly Father to thank Him in detail every week! Once you begin to think of things for which to be thankful, you will discover there is no end of subjects. Too often, probably way too often in our busy lives, we neglect being thankful in our prayers. The psalmist admonishes us: “Enter into His gates with thanksgiving, and into His courts with praise. Be thankful to Him, and bless His name” (Psalm 100:4). Thank God for who He is, as well as for what He has done. Thank Him for answered prayers (and even for trials, James 1:2); thank Him for the blessings He has given to humankind, to His Church, to your family and to you. Thank Him for His creation, whether huge parts of it (the universe) or small parts of it (a beautiful flower). Be detailed in your gratefulness. It will inspire you to become more grateful! And every day briefly ask for your daily needs, for God to forgive your sins as you forgive others, and for God to protect you from Satan.